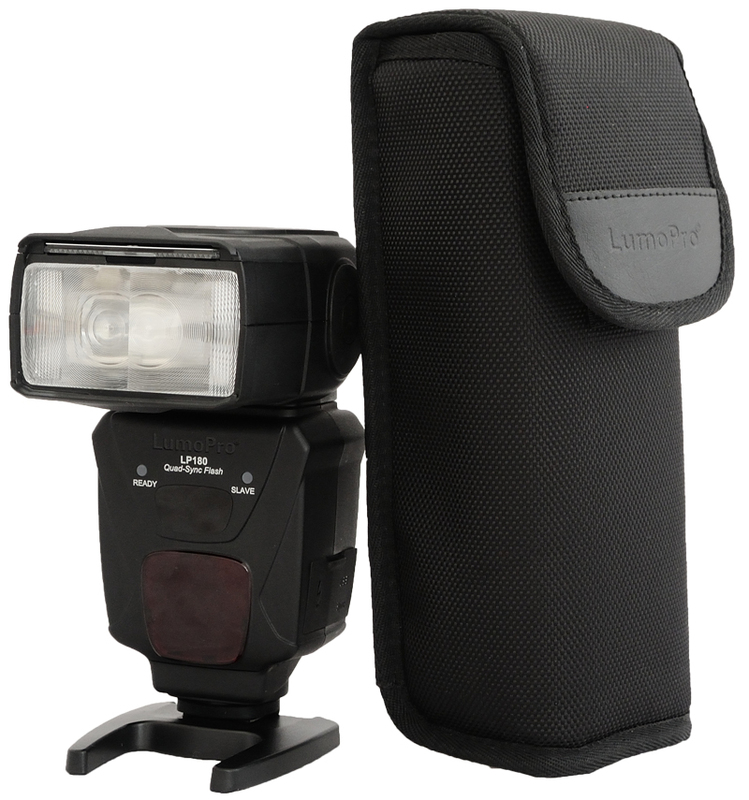 Today LumoPro finally unveiled their new flash, the LP180. It’s been a long time since the LP160 was discontinued so there has been a considerable gap in which some photographers might have been tempted to look elsewhere. Has the LP180 been worth the wait? Rather than make gradual improvements to each successive model, as camera manufacturers often do with DSLRs, LumoPro has seen fit to practically reinvent itself every time one of its flashguns is released. The LP180 looks totally different from the LP160, which itself was only vaguely similar to the original LP120. The latest model is bigger and has an accented design that’s clearly not sharing a mould with anything else out there on the market. It also has proper places for everything now, with a dedicated LCD screen and a covered I/O panel, compared to the random switches and seemingly tacked-on connectors of the past. Looks aren’t everything, of course. The feature list has also been filled out with a number of things sorely missing from previous LP flashguns, along with a couple of extra things — gimmicky or otherwise — that are fairly unique to this kind of photography tool. So, is it any good? For the first time, LumoPro supports battery packs. Along with the bevy of much-touted sync ports, the LP180 sports a Canon CP-E4-type high voltage connector so you can plug in an external power source to keep going longer and reduce recycle times. Pretty much every flash in this category already has one, and even did when the LP160 was around, so this added feature helps LumoPro catch up with the competition rather than pull ahead of it. What is a bit more unique though is the inclusion of an integrated filter holder. It’s little more than a slot in the front of the flash head, but should make it that much easier to use colour correction without having to stick Velcro dots everywhere. LumoPro even throws in a basic bundle of gels with every LP180. Each one is cut to be slightly too big so it bends away from the fresnel, thereby less likely to melt onto it with intensive use. This is a nice touch, though unless all your lights are LP180s then it’s probably easier to break out the Velcro dots and buy your own gels so they will fit all of your different flash heads. The LP180 also totes a tripod mount, similar to that found on the Godox ThinkLite TT660. This can be a handy way to get started with flash when you don’t have a lot of gear, as well as helping you out if you lose a bracket on a shoot. You can also take advantage of the fact that it’ll keep the flash head pointing closer to the central axis of a lighting umbrella. The ¼-inch thread is surrounded by rubber to ensure a firmer grip with whatever you choose to mount it on. However personally I prefer Godox’s implementation, with the tripod mount on the main body of the unit rather than on the side of the flash head, as it gives you more freedom to twist and turn the flash head independently of your light stand. Still, nice to have. I’m not particularly fond of the programmable optical slave feature. It seems like a solution to a problem I’ve never encountered. The preset “S1” and “S2” modes on most other flashes seem perfectly capable of synchronising with my Nikon i-TTL flashes. I don’t use AWL and I’m sure the number of people who would combine it with an aftermarket manual-only flash is a small minority. In the meantime, now I have to figure out which of the nine S-modes is the right one for ignoring basic i-TTL preflashes, whereas before this wasn’t a problem. 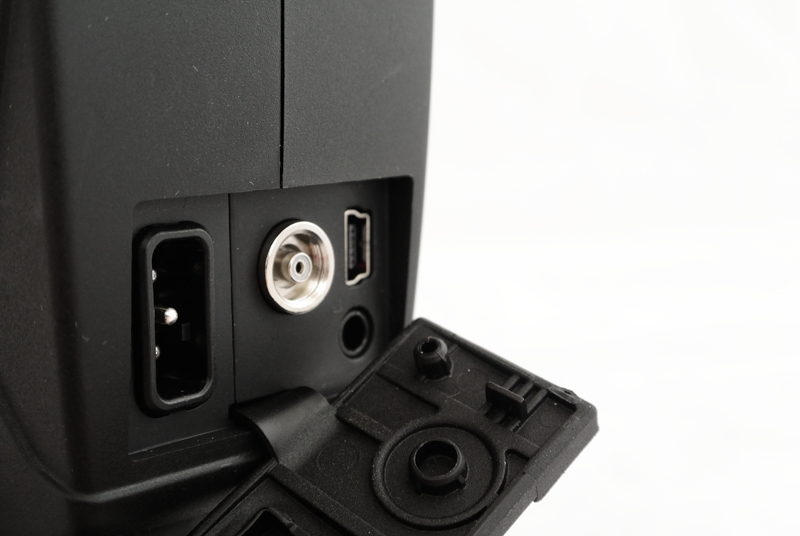 As well as the hotshoe and optical slave, the LP180 gets its “Quad-Sync” moniker from the other connections: the 3.5mm port and Prontor-Compur (PC) jack. These are neatly stowed behind a rubber flap on the left side, along with the USB port and CP-E4 power input. LumoPro doesn’t get the title for most sync ports: that honour goes to the Witstro AD180, which has a full-sized USB port for remote control. Unlike that flash, the LP180 does not support any kind of wireless power control. It is meant to be a “basic” flash, after all. Still, some kind of built-in radio would be nice (though I’m not sure which brand they would make it compatible with) — maybe a “Quint Flash” in the future? Despite the I/O cover and the rubber gasket on the foot, we are told that the LP180 is “not water-resistant”, so it’d be wise to take the same precautions in wet weather as you would any other bit of electronic kit. The LP180 looks like a bit of beast: somewhere between the Batmobile and a Stormtrooper, the design is, to say the least, distinctive. With batteries, it weighs 539 grams, which is a little bit heavier than some other units in the same product category. It’s also quite long (about 22cm) so you might not be able to cram as many of these into a small bag as you would, say, Canon 430EX IIs or Nikon SB-600s. There isn’t any practical purpose for the accented appearance, though it does feel correspondingly well-built, which is a plus. You won’t find any clever Quick-Bounce pivot mechanism like in a Sony flashgun, nor are there any Sunpak-style accessory mounts, except for the filter holder. Indeed, LumoPro acknowledges that some things, such as the red window on the front, serve no function for the time being. “The red window is actually an empty cavity that could potentially house AF-assist circuitry or other potential remote abilities in the future,” said product manager Kevin Deskins. So it might be handy if they make an LP-TTL in future, but for now it’s just for show. Indeed, however mean and cool the LP180 appears from the outside, it actually has sharp edges in places that can make it uncomfortable to operate. In particular, watch out for the corners of the gel slot and the battery compartment door. The flash head mechanism doesn’t lock into any position, which means you’ll have less versatility with speedlight modifiers such as the Ezybox Hotshoe or GamiLight series. More annoying, though, is how the swivel movement seems to have been damped so it takes more effort and time to turn it than seems necessary. 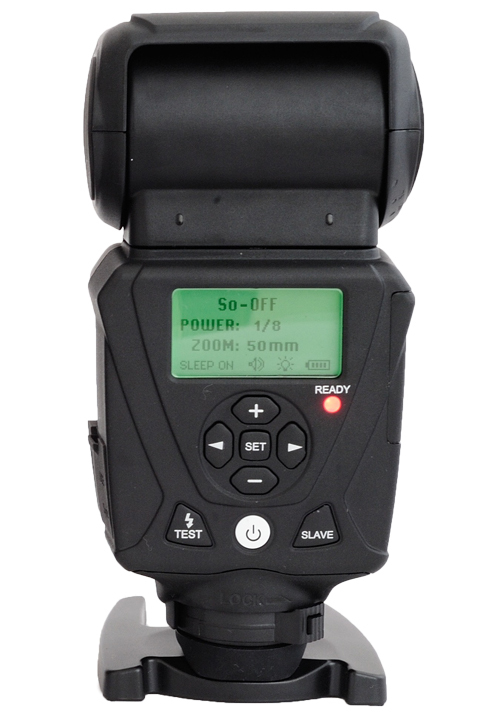 This gets old fast if you’re using the unit on-camera for bounce flash and need quickly to change the orientation of the light. Operating the controls is simple enough and the buttons have a good response. Adjusting power and zoom is very easy and you get 1/3-step level precision to boot. An on-screen battery level indicator is nice to have. The LCD — the first on an LP-series flash — is a bit of a disappointment. It’s too glossy and not very easy to read unless you are looking at it head-on — which isn’t always practical if your flash is mounted up on a stand. Screen space, scarce to begin with, is squandered. By wasting space on pointless “POWER” and “ZOOM” labels (or telling you that the optical slave is switched off, rather than simply not displaying it), the settings themselves are so small that they are hardly legible from a distance — worse still when combined with the LCD’s poor viewing angles. Having a dot-matrix screen seems like a wasted opportunity when every single setting is displayed on it at the same time. In beta testing I recommended to LumoPro that they change it so that the power and zoom levels take up the whole screen, alternating every couple of seconds and showing the less important stuff (sleep, beep and slave functions) only when you’re actually using the controls. In response, Deskins said: “We’ll look into this on a firmware update in the future.” Fingers crossed. Having recently reviewed the Yongnuo YN560-III, it is difficult not to make comparisons. As well as a clearer interface, the YN offers much more customisation over things like sleep and LCD back-light timers, choice of power level increments and more. Measuring the absolute brightness of a flashgun is a challenging task because it’s difficult to standardise a proper test. However, I was able to compare the LP180 to other flashes I had on hand. At full power, the output is identical to that of the Yongnuo Speedlite YN560-III and one stop brighter than that from the Godox ThinkLite TT660. Using a Sekonic L-358 light meter I measured f/29 at one metre, Iso-100, 1/125 second with the flash set to the 50mm zoom position. 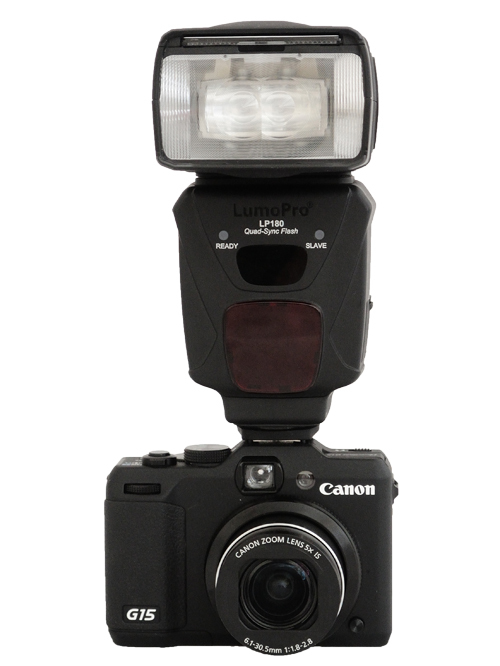 With performance on par with other good flashguns, you won’t find yourself caught short with the LP180. If you think you do, your problem may be more to do with whether you should be using speedlights, not which one to get. If you really need more oomph then you might be more interested in trading up to a larger studio light or some kind of hybrid like the Witstro AD180. The unique selling point of the LumoPro is ostensibly its “Quad-Sync” range of connectivity options. For your money (US$200 of it) you get the flash, a soft case, a mini tabletop stand, a 3.5mm to 3.5mm sync cord and two packs of gel filters (one of colour correction and one for colour effects). Is that good value? About three years ago the answer would probably have been yes. But now there’s a whole host of third-party flash manufacturers so competition is fierce. At the end of the day, the LP180 does not offer any massively compelling features over Yongnuo, Oloong et al to justify being twice the price of similarly-specced manual flashguns. It is good, but by no means head-and-shoulders above the current top products on the market. It’s also hard to overlook the LP180’s mediocre LCD. 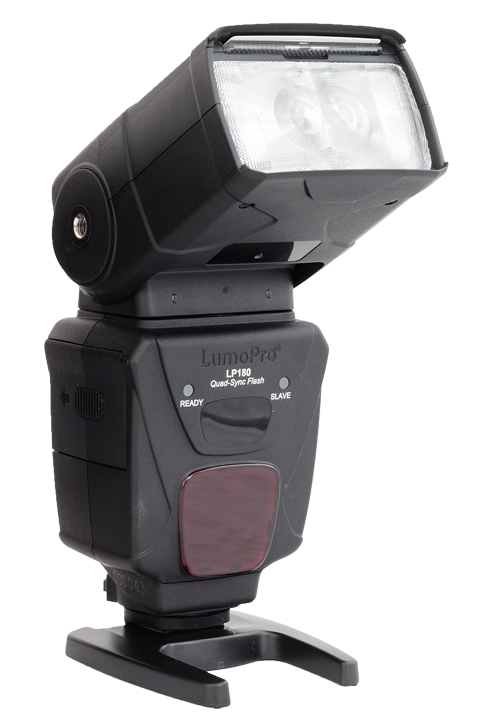 What LumoPro does have is a two-year warranty. While this is great for Americans, it’s a bit more of a push for people in Europe to buy from a Dutch store they’ve otherwise never heard of, when they could just get something cheaper from their trusted local eBay seller. But that’s a personal decision that depends more on where you live and past experiences. Which would you prefer? 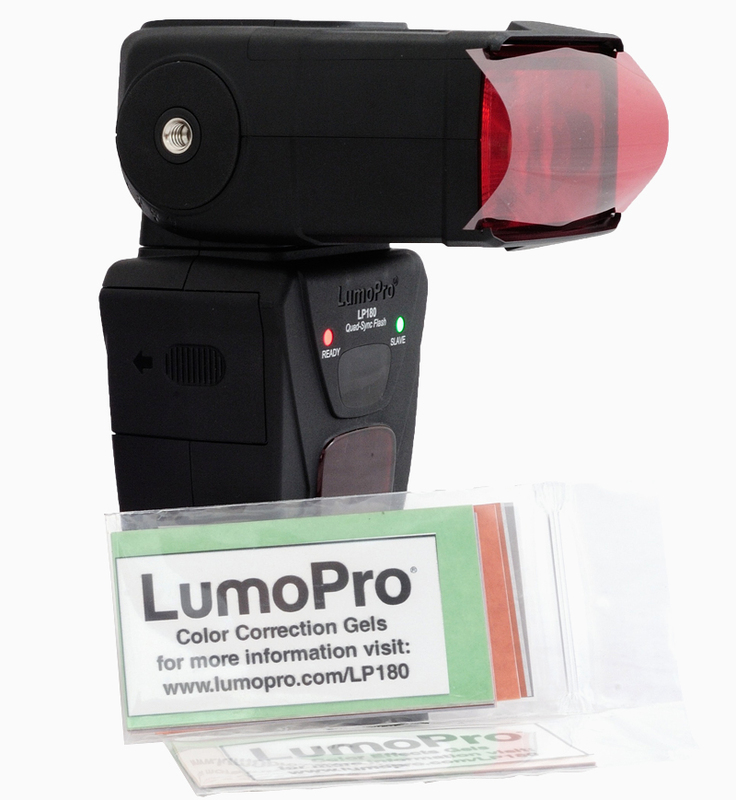 The LumoPro LP180 retails for $199.99 at Midwest Photo Exchange. That’s in the US. The EU distributor is CameraTools.nl and hasn’t announced euro pricing yet. (Update: 199.95€.) 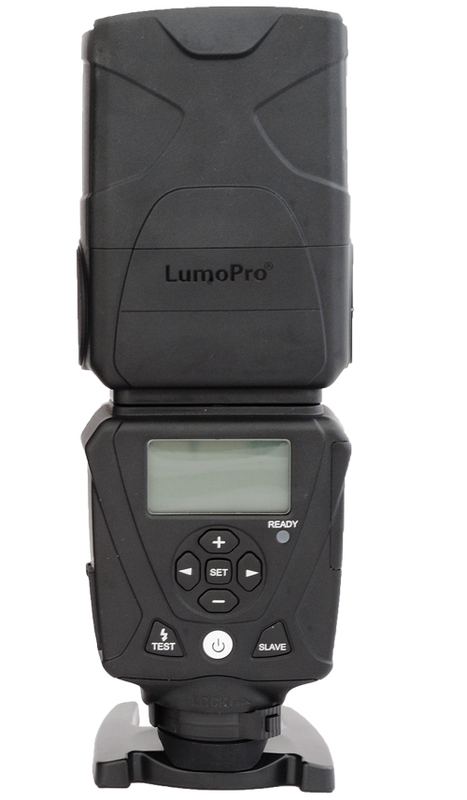 Other international dealers are listed on the LumoPro web site. Visit lumopro.com for more information.